Getting to Know Richard Carreon, Mar Vista High School's New Principal and his Ideas on the Students, Campus, and the Community. Last week I had the chance to sit down and speak with Mar Vista High School's new principal Richard Carreon or as he likes to be called, Rich. Both Rich and his wife have both chosen to work in the field of education. His wife is an elementary teacher in Chula Vista while Rich has spent 22 years in the Sweetwater School District. He has spent 11 years as a teacher and the last 11 years in administration. His first concern, as it should be, is for the students. He spent a lot of his first 6 months listening to and studying the 1550 students on campus. Rich wanted to study their strengths and areas in need of Improvement so he could evaluate how to best meet the needs of all students. Rich would like every child to have the opportunity to go to college if they want, or be on a career path if they don't. He wants all the students taught to be Good Citizens and give back to the Community. And, for the children that run into trouble, Rich has his "Restorative Practices". He feels they should be taught behavior and accountability. Once that’s done, then their reintegration back into the school with a fresh slate. He considers Mar Vista High School in a unique place. It is the only high school in Imperial Beach and it is very close to the ocean. He wants to capitalize on that uniqueness for the students. The first thing he is doing in that area is bringing back the very popular surfing class. They used to have it before regular school starts in the morning and he is planning to reinstate it with the help of Matt Wilson. Matt, who is very popular and teaches English at Mar Vista is also an Imperial Beach Lifeguard and will teach the class. He also wants the students, and the school. to reach out collaborate with the community. Some classes he thinks will go over very well are: Sports Medicine, Fire Science, and Multi Media. Not all academics or school spirit take place in the classroom. About half the school buildings have recently been modernized or upgraded. For some of those that haven't, Rich would like to see a large quad in the middle of campus so the students would have a place where they could come and hang out together. To do that, several of the buildings that haven't been upgraded would be torn down with a 3-story building taking their place. That would open up space for the quad and give them a nice new building in the process. For another improvement, the Sweetwater School district has set aside a little over $6 million for a new pool at Mar Vista High School. He had drawings or sketches for this and a potential location for the pool, as well as drawings for the quad, on a table in his office so that we could view them. He has reached out to the City of Imperial Beach regarding the pool, and they have had talks with the City of Imperial Beach about the possibility of a dual use pool. The idea being that when the students aren’t utilizing the pool it could serve as a community pool. When asked about this Imperial Beach City Manager Andy Hall stated, "We are very interested in working with the district to improve the swimming pool facility. We are hopeful that our involvement will result in more public access to the pool for all Imperial Beach residents". Rich’s drawings show the pool at the far west end of campus. Just off Elm Street with a new parking lot for the pool right next to it. Starting soon, as another way to reach out to the community, Rich will be writing a Monthly Column for Dig Imperial Beach. 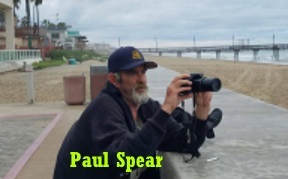 In the Monthly Column, he will address the community of Imperial Beach and inform them of what is happening at the Mar Vista and his thoughts on relevant topics he feels will be valuable to them. As you've seen in recent weeks, because of his willingness to reach out to the community, Dig Imperial Beach has more stories about Mar Vista High School and its students. Coaches and educators at the school are communicating much more than in the past few years making it much easier for our publication to follow them. To keep in touch with the parents of the students, Rich is doing a weekly newsletter, The Mariner Times. When working in his office, Rich can be found standing behind his desk working on the computer. He likes standing while typing and taking calls. Rich is a serious and good natured person. Truly wanting the best for all his students. Rich's plans and goals seem very realistic and obtainable. We wish him the best and look forward to working more with him, the students, and the staff of Mar Vista High School.